The black-and-white patterned top is something I bought years ago, and I can't remember where. I think it might have been Avenue. The trousers are Chloe Coated Skinny Jeans from Simply Be, which are currently on sale. They are very comfy and the fit is great, so I recommend them, but with the caveat that they do make some noise (especially when you first put them on), so if you are a person who would feel super self-conscious about audible pants, take a pass on these. Anyway! 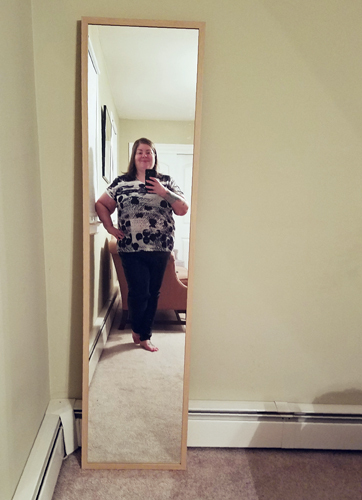 As always, all subjects related to fat fashion are on topic, but if you want a topic for discussion: Are there any items in your closet that you are either inclined or disinclined to wear because they elicit attention?